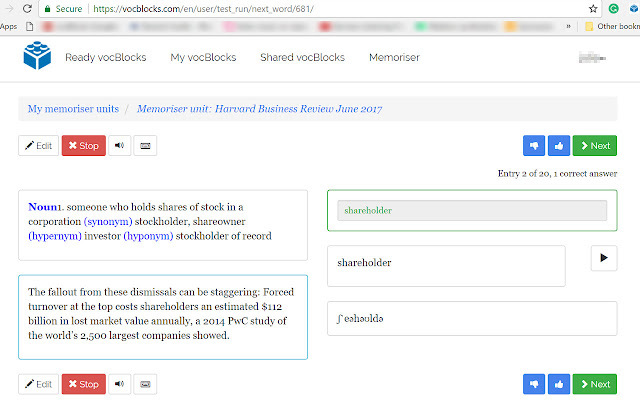 vocBlocks LookUp is a dictionary extension for the Chrome browser you can download from the Google Store for free. It makes your reading online easier as you can Ctrl + double click unknown words to see their translation or definition plus audio pronunciation directly on the web page. Note: please use Alt + double click on Mac. But there is more to vocBlocks LookUp than just a dictionary you have a click away. vocBlocks LookUp packages the words you have looked up together with the context in which you have come across these words into a vocBlock so that you could learn them. You can download vocBlocks LookUp from Google Chrome Store. Just click on the blue ‘Add to Chrome’ button in the top right hand corner of the window. Once the extension has been downloaded, you will be able to use it straight away. With vocBlocks LookUp you can look up unknown words in two ways. 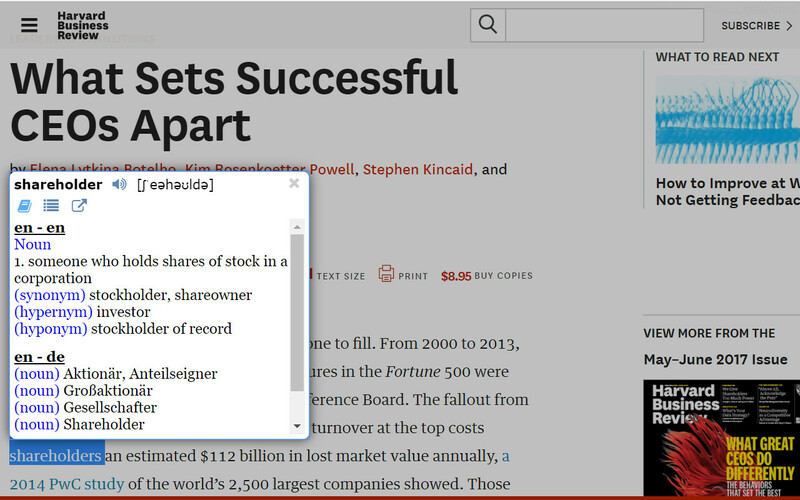 You can Ctrl + double click the words you need to look up (please use Alt instead of Ctrl for Mac) and a pop-up window with definition or translation will appear on the same webpage. Please note that the extension will ask you to sign in before you will be able to use it. Alternatively, you can look up words by opening vocBlocks LookUp in a separate browser tab and copying and pasting or typing these words into the lookup field. To open vocBlocks LookUp as a dictionary app in a separate tab, you need to click on the blue block symbol you have in your Chrome toolbar. Here you get the same look and feel as in the pop-up window. Depending on your level, goals or just personal preferences you can choose between translation into your native language and definition in your target language. For example, if your level is intermediate and above, definition might be more suitable as it can give you a better idea of the meaning of the word especially if there isn’t any equivalent in your native language or there are several equivalents and the translation doesn’t provide a clear picture. Choosing definitions also helps you bypass your native language increasing the level of immersion into the target language. On the other hand, if your task is translation into your native language, you will obviously need to choose translation to make the process quicker. If you would like to have both translation and definition for one and the same word in one window, you will need to choose more than one combination of languages under ‘Options’ in the vocBlocks LookUp window (see the screenshot below). For example, if you are learning English and would like to have both translation from English into your native language and definition in English, you will need to choose two combinations of languages: English - your native language and English - English. In the same way, it’s possible to have translation into more than one language in the same window. For example, if you are learning German and would like to boost your English at the same time (English not being your mother tongue), you can choose the following two combinations of languages: German - your native language and German - English. The history will be available on the right hand side as a list of words you have looked up so should you need a quick access to a word you looked up before you can do so easily and quickly. You can also have several tabs for different words open so that you can flick between them if, for example, you need to compare synonyms. Words come with transcription, as they do in a dictionary, and audio pronunciation. To listen to the way words are pronounced, you need to click on the sound icon. Once you have looked up a number of new words, the extension will automatically package them into a new vocBlock called, for example, ‘Memoriser unit: New words, en-en, 10 Sept 2017’ and send it to Memoriser for learning. As with any other vocBlocks that you have in Memoriser, the tool will be sending you email notifications reminding you to practise. 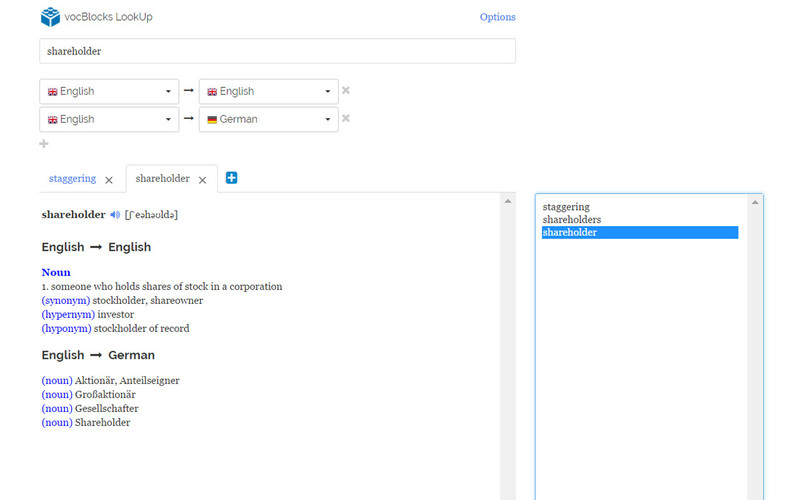 The words in these automatically created vocBlocks will be recorded with their definitions and/or translation. The extension will also automatically record the context (the sentences) in which you have come across these words. You don’t need to learn the context of course, it’s there to remind you of how the word is used and to help you remember it better. If you decide you don’t need to learn all the words you have looked up, you can edit the vocBlocks the extension created for you and leave only the words you need to learn. Just click 'delete' button for the word you don't need when doing the exercises. We hope that you find this short guide on vocBlocks LookUp useful. But if we have missed anything or you have a question please do not hesitate to drop us a line.